If you love coffee, nothing beats the aroma and taste of a full flavored cuppa that’s been perfectly brewed to your preference. Add in a serving of toast on the side and voila! Your day has just gotten off on the right foot. Coffee culture is big in Singapore. From heartland coffee shops to their modern day counterparts in the heart of the city, these places have been serving endless cuppa joes and some have been doing it for decades. 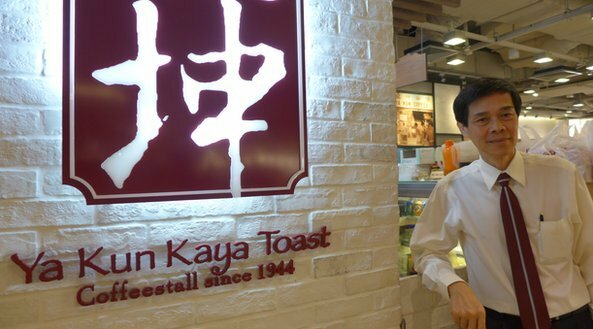 One such establishment is Singapore’s very own Ya Kun Kaya Toast. Ya Kun is synonymous with coffee and success. From a single stall operating in the typical “mom and pop” fashion in the Telok Ayer Basin region of downtown Singapore. the coffee and kaya toast brand has today become arguably Singapore’s most recognized coffee shop with franchises across the island. Ya Kun’s success has also seen it spread a huge dollop of its famous kaya toast and coffee across other parts of Asia as well. So what’s the secret behind the brand’s success? Stepping foot onto a foreign land for the first time can be daunting for a grown man; whatmore for a 15-year old boy. Nonetheless and though without kith or kin, Loi Ah Koon (founder of Ya Kun and whose name the brand takes after) a Hainan immigrant took it in his stride. He eventually found work as an assistant in a Hainanese coffee stall and picked up the trade quickly. He eventually saved enough and together with 2 other fellow immigrants, set up their own coffee stall business. Though his partners later left to the venture, Ah Koon wasn’t discouraged nor did he give up. Armed with an unwavering determination to succeed, he persevered on. Business was as usual. Loi Ah Koon then got married and in 1936, his wife joined him in Singapore. His wife began perfecting her homemade kaya recipe which they began to serve their toast with. Ah Koon also began to roast his own coffee during that period and soon business was really taking off. In these early days, he would often be found sleeping on the hard wooden countertop of his stall instead in the comfort of his home. He does this just to be on time to serve his first customers who would come in at 5 am. His service standard was also something of an example. Even in the face of incensed customers, Ah Koon would often just smile, shrug it off and go on about his chores; serving delectable cups of coffee and delicious kaya toasts that not only melts in the mouth but would even eventually melt even the most irate of customers. Business continued to soar and provided the couple with ample rewards and resources to raise 8 children. In 1998, Ya Kun Coffee Stall moved to its current location at Far East Square, right in the heart of Singapore’s Central Business District. Loi Ah Koon passed away soon after the move. Carrying on his late father’s legacy and exemplary success, Adrian Loi Ah Koon’s youngest son, expanded the Ya Kun brand that included brand franchise. With a strategy which encompasses the procurement of intellectual property rights (IPR) in its domestic and target international markets for trademarks, copyrights and any other intellectual properties, the franchise program became a success. Within 4 years of the program, Ya Kun’s franchises accounted for half of its business and 20% of its net profit (before tax). During the course of 2005 to 2007, Ya Kun received product rewards from the Singapore Institute of Food Science and Technology (SIFST). In 2005 and 2005, the brand received perhaps the highest accolade in consumer brand excellence when it was recognized as a “Superbrand” by the international Superbrand. By the year 2010, Ya Kun International has cemented its presence with 40 locations throughout Singapore and 30 international locations in parts of Asia including Brunei, Indonesia, Japan, the Philippines, the Republic of Korea and Taiwan (Province of China). Ya Kun’s coffee and kaya toast has become the quintessential breakfast for locals and expats alike in Singapore. The Ya Kun story is about a boy driven by his ambition who, through sheer hard work and determination, managed to achieve success and along the way created a home for coffee lovers in a country that became home to him. His success was carried on by the generation succeeding him whom with foresight and business acumen, propelled the brand even further. In many ways, the Ya Kun growth and success story almost mirrors that of the adopted homeland of one Loi Ah Koon himself. Ya Kun is truly not just a coffee shop, it’s arguably a national icon as well. And Singapore’s ubiquitous coffee culture can only spur the brand to further heights. Post by Ya Kun Coffee & Toast – 亞坤, Hong Kong.